With the last days of June, the summer festival season is taking off and the sound of violins and drums will shake up the lay-back Tuscan hilltop towns. Classic, pop and jazz festivals will be hold in Siena, the Val d'Orcia, the Maremma and even in the remote villages around Mount Amiata. It's a summer of beat until September, when the festival season closes with the final concerts on the isle of Elba. MELODIA DEL VINO, from June 27 to July 6 at various wineries in Tuscany. The young festival brings Mozart & co. to the world of wine. The concerts will take place in famous Tuscany vineyards (some of them designed by the world's archistars like the Petra winery by Mario Botta or Renzo Piano's Rocca di Frassinello). AMIATA PIANO FESTIVAL, from June 27 to September 1 in Poggi del Sasso near Cinigiano. The three cycles of classical music (with four concerts each month) have become a major event for Maremma's culturally minded. The concerts of the Dionisus cycle at the end of August take place in the stunning contemporary wine cellar of the Collemassari winery in Cinigiano. TERRE DI SCANSANO, from June 29 to September 1 in Scansano and Port'Ercole. In its second edition, this is another festival attempting to blend wine (Morellino di Scansano) with music. It looks like a big proportion of the world's chamber music lovers enjoys spending their summers in Tuscany. INTERHARMONY, from July 3 to 15 in Arcidosso. Mount Amiata goes classic with the international summer school organized by Russian cellist Misha Quint. Concerts by students and professors in Arcidosso's small but lovely theater. MUSICA REALE, from July 7 to 12 in Montalcino. A selection of musicians from Amsterdam's famous Concertgebouw Orchestra play chamber music in Montalcino's theater... and are happy to have a chat with you at the after-concert dinners organized right in town. GEORG SOLTI'S ACCADEMIA, from June 28 to July 13 in Castiglione della Pescaia. "It is to enable singers not to sing simply as they have been told to sing, but to find out how they want to sing" is Dame Tiri Te Kanawa's statement about the Bel Canto master classes. Georg Solti's and Te Kanawa's prolific work relation extended to the summer master classes on the Tuscan coast. Visit one of the academy's summer concerts to hear for yourself whether the students have managed to find their own approach to opera singing. CHIGIANA, from July 9 to 18 in Siena. In it's 70th edition the Settimana Musicale Senese take place every July in Palio town. Organized by the Accademia Chigiana, Siena's famous classical music academy, the week is followed by master classes and L'Estate Musicale Chigiana, a concert cycle lasting from mid July to the end of August, with concerts taking place in Siena, but also in San Gimignano, Pienza, Scansano and Sant'Antimo, the stunning Romanesque abbey near Montalcino. IT'S LA FOCE, from July 19 to 28 in the Val d'Orcia. Celebrating its 25th anniversary, the classical music festival in the Val D'Orcia is organized by cellist Antonio Lysy, grandson of writer Iris Origo. It's la Foce brings some of the big names of Europe's classical music scene to Pienza, the La Foce estate and Montepulciano. CANTIERE INTERNAZIONALE d'ARTE, from July 19 to 28 in Montepulciano. Founded by German composer Hans Werner Henze in the 70s for the promotion of new music, Montepulciano's Cantiere is one of the most longstanding music festivals in Southern Tuscany. To be accompanied by a glass of Vino Nobile di Montepulciano. MONTISI MUSIC FESTIVAL, July 24 to August 2 in Montisi. More master classes, but this time on the harpsichord. Christopher Rousset and the students of the summer school will play the historic instruments of the harpsichord collection in Montisi. Take the time to have an aperitif beforehand in the lovely village nestled between Val d'Orcia and the Crete Senesi. ACCADEMIA DELLE CRETE, July 28 to August 2 in Asciano, Castelmuzio and Pienza. Travelling in the footsteps of the English Patient? Sant'Anna in Camprena near Pienza is one of the locations of the Accademia delle Crete concerts. The festival has been founded by Belgian director Philippe Herreweghe, one of the initiators of the original instruments movement. 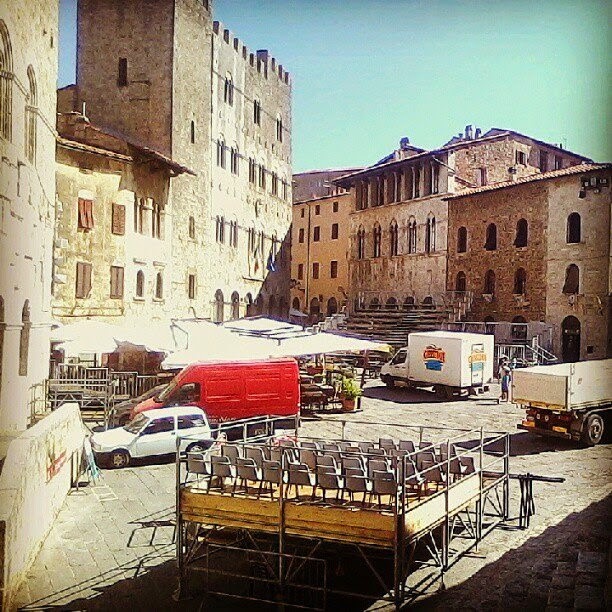 LIRICA IN PIAZZA, August 1 to 4 in Massa Marittima. 2013 marking the 200th anniversary of Giuseppe Verdi, Rigoletto and Il Trovatore make up the program of the opera festival in front of Massa Marittima's cathedral. No doubt, town square and cathedral in Massa Marittima make for one of the most amazing 'natural' stages in the Maremma and the rest of Tuscany. ELBA MUSIC, August 30 to September 8 on the isle of Elba. Tuscany's high season and the classical music frenzy will find their close in various concert locations on Napoleon's isle. VOX MUNDI FESTIVAL IN MAGLIANO, June 29 to August 2 in Magliano in Toscana. Dedicated to folk music from every corner of the world, the Vox Mundi festival has had me dancing many times. Come early so as to have time for a walk around Magliano, one of the loveliest towns in this most southern corner of Southern Tuscany. JAZZ & WINE, June 26 to July 21 in Montalcino. Back to UNESCO world heritage Val d'Orcia for Brunello town's Jazz & Wine. I've been attending this festival every July for the last 15 years and still haven't gotten tired of it. No surprise, if you consider the impressive line up of national and international jazz musicians. SIENA AND STARS, July 10 to August 2 in Siena. A welcome addition to Tuscany's summer festival program is the first edition of Siena and Stars. The new music festival brings sound and nightlife to Palio town's piazza del Duomo (the square in front of Siena's cathedral). Cuba meets Tuscany thanks to the concert of Buena Vista Social Club, whilst Mario Biondi, Pino Daniele and Baustelle are some of the best names in Italian pop music. BOLGHERI MELODY FESTIVAL, July 18 to August 18 in Donoratico on the Etruscan coast. Everything goes at the Bolgheri festival. Italian comedy, musical, classical music and ballet with Italian primo ballerino Roberto Bolle. The location right next to the highway seems a strange choice, but a glass of a super Tuscan red wine from Bolgheri will very likely make up for it. The CAVA PARCO DI PIETRE, June to August in Roselle near Grosseto. The lovely Tuscan outdoor setting in an ex-quarry near Grosseto, pop and jazz concerts and theater performances with a critical point of view on Italy's politics account for the faithful following this festival gets from Maremma's locals. Come early as parking is limited (you can eat at the restaurant en lieu). GREY CAT FESTIVAL, August 2 to 24 in various locations in the Maremma. The program isn't out yet, but no doubt the concert calendar for the gigs in Grosseto, Gavorrano, Castiglione della Pescaia and Follonica will be as exciting as every year (last year's edition has been crowned by the concerts of Italian star jazz pianists Stefano Bollani and Danilo Rea). FESTAMBIENTE, August 9 to 18, Rispescia near the Maremma National Park. Pino Daniele, Daniele Silvestri and Max Gazzè are opening Italy's most famous green festival (festambiente = feast of the environment). The festival is organized by Italy's Lega dell'Ambiente, a sort of Italian Greenpeace. Not just Italian pop music, but open-air organic restaurants, market stalls and a kid's program make of this festival a fun day out for the whole family. Loved by the locals, it does get crowded. Arrive early (before 7.30pm), to avoid the long queues. SANTA FIORA IN MUSICA, July 20 to August 25 in Santa Fiora. Escape the heat and go off-the-beaten-track on Mount Amiata. Santa Fiora hosts an array of concerts ranging from jazz trios and classical concerts to brass bands. For Tuscan folk music lovers, don't miss out on the concert of Italian pop singer Simone Cristicchi, who will be accompanied by Santa Fiora's miners' choir.